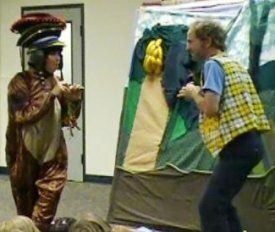 "The Hat Seller and the Monkey " is one of the stories that toured in 2012-2013. This page is for teachers to use to extend the learning experience. The activities on this page are story specific and are designed as follow-up to the performance. Also see the Study Guide Main Page for activities to prepare your students for the show in general. 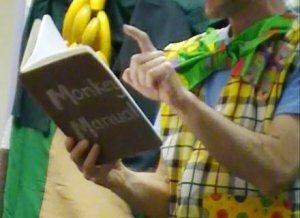 The Hat Seller and the Monkey is a tale told entirely in pantomime, set to original music by Dennis Goza. The story opens with a Hat Seller who is trying to make his way across a jungle to a town in Mali known as Timbuktu. However, he gets lost along the way. Along comes a monkey who steals the hats while the Hat Seller takes a nap. Fun and hilarity ensue as the Hat Seller tries to get his hats back from the mischievous Monkey. The most popular published version of this story is "Caps for Sale" by Russian author Esphyr Slobodkina, first published in 1938. There is also a version from Mali called "The Hatseller and the Monkeys" by Baba Wague Diakite, published by Scholastic in 1999. At your local library j398.2 is where you will find more folktales from around the world. The story of the Hat Seller and the Monkey is told in many countries, but it may have originated in Mali, where we have placed it. Mali, now officially called the Republic of Mali, is located in western Africa. A large portion of the country in the Northeast extends into the Sahara desert, but most of the inhabitants live in the Southwest, especially the capital city of Bemako, which has more water (and more trees for monkeys to hide in). The Hat Seller in our story is on his way to Timbuktu, which has been a city in Mali for about 800 years. In the past, it was a wealthy center of trade and learning. European travelers spread so many stories about its wonders that Timbuktu became a word meaning some distant, mysterious place. Today, however, the city is very poor like most of the country. What tools do we use to help us find our way when we are lost in the real world? Have your students create maps and directions for the other students to follow. Bring a variety of hats to show the class. Or better yet, have a Hat Day and ask each student to wear their favorite hat to school. Discuss the jobs associated with the hats and the type of people who wear them. Easy to follow How To Video and instructions with links to relevant Common Core State Standards. Here is a simple theatre game that your students can do whenever you have a few minutes to fill. It will increase their observation skills and develop team work. Ask them to pair off and choose an "A" and "B". "A" will begin as the person and "B" will be the mirror. You can set restriction such as no talking and no moving your feet. Or have them do the exercise in slow motion. Allow them to proceed for a couple of minutes and then tell them to switch so "B" is the person and "A" is the mirror. As they get more proficient (perhaps on the third or fourth day) call "switch" more frequently, eventually getting to the point where no one knows for sure who is leading and who is following, and they are moving as one. This story is presented in a style known as pantomime or mime. These two words often are used interchangeably, and there is some confusion about their precise meaning. Let's see if we can make it even more confusing. The word mime is derived from a Greek word meaning actor; the implication is that a mime is someone who tells a story or conveys an impression by showing rather than telling. And the one thing that mimes have in common is that they use actions rather than words. In this sense, Charlie Chaplin was a mime. In Shakespeare's time, a mime act was called a "dumb show" (dumb meant silent, and was not intended to be a critical analysis), and he inserted one as an interlude in at least one of his plays. But it has become more common to use the word mime to mean someone who acts out scenarios not only without words but also without props – i.e., who uses only his or her body. Marcel Marceau was undoubtedly the most famous mime, and you've probably seen at least one of those white-faced practitioners of the art following in his footsteps. Pantomime, which in Greek means something like "all of the actors" or "all of the actions", was originally an art form of much more complex requirements; it might include silent mime, but also involved dialogue. 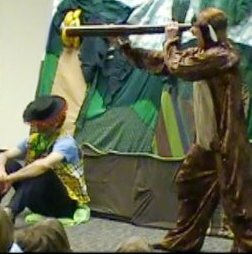 Originating in ancient Greece, a pantomime was set to music and involved a variety of characters and performance styles. It was snubbed by the upper class as being vulgar and distasteful. During the Middle Ages and Renaissance, the pantomime evolved into a broad comedy using recurring stock characters and masks. It developed into different varieties in different countries, such as the Commedia Dell'arte in Italy and the Mummers' Plays in England. What came to be called Pantomime in England were performances that dealt specifically with yuletide themes. So our story doesn't really fit neatly into either of these categories. It's unspoken like mime, but is set to music like much pantomime was, and we use props unlike most contemporary mimes. Of the two labels, we consider pantomime the more appropriate for what we're doing. Clowns and humorists often use exaggeration to make people laugh. Storytellers have often concocted tall tales about events that couldn't possibly have happened, sometimes with characters of exaggerated size (i.e. Paul Bunyan). 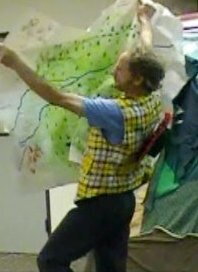 Exaggeration might include the large shoes and baggy clothes of a clown, or the use of oversize props such as the telescope and the map, or exaggerated actions such as the Hat Seller's angry reactions to the Monkey. How many exaggerations do you recall from the story? Discuss and encourage your students to act out what they remember. Would dialogue have made it work better or not as well? Why? If the characters had spoken, what might they have said to each other? In times past, the city of Timbuktu had a reputation for being a place of marvels and mystery, and many fantastic stories were told about it. If you were to visit such a place today, what might you expect to see?